Pallet rack is one of the most common material handling products in the industrial world. Mostly used in industrial warehouses, pallet rack provides the ability to store a high amount of inventory and gives a company the ability to take advantage of the vertical space of their facility. The S. W. Betz Company provides customers new and used pallet rack on a daily basis. We also repair and install pallet rack. As with most items in the materials handling industry, it is important to consult a professional when trying to identify the pallet rack or pallet rack system that will best suit your needs. There are a number of different types and sizes of uprights, beams, wire decking, row spacers, and other accessories that will help make your pallet rack system as effective as it can be. One of the biggest details to consider when a customer is assessing their need for pallet rack is whether to buy new or used. New pallet rack is always being manufactured and the customer does not need to worry about whether someone will buy it before they do, as is the case with used pallet rack. 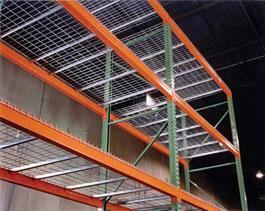 With used pallet rack, once the rack is sold, it is gone until more used rack is made available. Another advantage of new rack over used pallet rack is that the capacity is able to be guaranteed. When selling used pallet rack, there is no way to determine the load capacity of the rack. With new rack, the load capacity is indicated by both the manufacturer and the distributor. The most obvious advantage of used rack over new rack is that used rack is normally more cost-efficient than new rack. The S. W. Betz Company has extensive knowledge of new and used pallet rack and has many sources for new and used pallet rack. From the design or your warehouse’s pallet rack to the installation and completion of the project, we provide a complete turn-key solution. For new pallet rack, we proudly distribute pallet rack for many manufacturers including Husky Rack and Wire. We have many different sources for quality, used pallet rack. If you are in need of or would like more information on any of our pallet rack, please contact us and one of our team members will be happy to assist you. For more information about Pallet Rack or any other product or service from S.W. Betz, fill out and submit the form to the right.